The condos at 401 Water Street offer soaring twelve - fifteen foot ceilings, abundant windows, exposed brick walls and ductwork. Inviting balconies allow you to experience the magnificent views of the Illinois River from the privacy of your own condo. Residents also enjoy the use an inviting lobby, secure coded entry and an adjoining parking deck. At home or at work, you will find 401 Water Street to be an inviting downtown destination. Sharp, John, "Developer Looks to Reinvigorate Downtown Buildings." Peoria Journal Star. 18 September 2009. Kemper, James. “Riverfront Revitalization.” Revitalization. March/April 2006. Martel, Janelle. “Modern Perspectives: A Creative Blending of the Old and the New.” From House to Home. January 2004. Deshinksy, Erinn. “Urban Chic, Meet Water Street.” Voice. 7 November 2003. Ramsey, Mike. “Transformation of Old Eyesore About to Begin.” Peoria Journal Star. 9 October 1999. Unit 702 - 1500 square foot, 1 bedroom, 1 den/bedroom, 2 full baths, whirlpool in master bath, huge walk-in closet in master, granite throughout unit, open contemporary concept with curved interior wall, custom kitchen (updated appliances). Unit 810 Description: Sophisticated and Contemporary Condo Featuring Beautiful Hardwood Floors and Plenty of Natural Light. Private Patio Overlooking the Impressive River View. 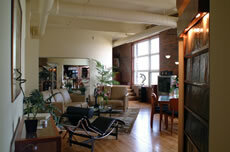 Dynamic 12 ft Ceilings and Brick Walls Make this Condo Unique.